Larry D. Thompson has served on the University of Georgia School of Law’s faculty as the holder of the John A. Sibley Chair of Corporate and Business Law since 2011, noting he was on a leave of absence from June 2012 through 2014. He is presently a member of the Faculty Division of the law school's Dean Rusk International Law Center Council. Thompson first retired from PepsiCo in May 2011. In June 2012, he rejoined the company as executive vice president, government affairs, general counsel and corporate secretary. His responsibilities included leading PepsiCo’s worldwide legal function, as well as its global government affairs and public policy group and its global citizenship and sustainability team. Thompson again retired from PepsiCo in December 2014. Thompson has extensive leadership experience in both the public and private sectors. In 2001, Thompson was confirmed by the U.S. Senate as deputy attorney general of the United States. As deputy attorney general, Attorney General John Ashcroft named Thompson in 2002 to lead the Department of Justice’s National Security Coordination Council. Also in 2002, President George W. Bush named Thompson to head the government-wide Corporate Fraud Task Force. From 1982 to 1986, he served as U.S. attorney for the Northern District of Georgia where he led major political corruption and drug trafficking prosecutions brought by the U.S. Attorney’s Office. As U.S. attorney, Thompson also led the Southeastern Organized Crime Drug Enforcement Task Force. Thompson has held other significant leadership positions in the public sector. In 1995, he was named independent counsel for the Department of Housing and Urban Development Investigation. In 2000, he was selected by the U.S. Congress to chair the bi-partisan Judicial Review Commission on Foreign Asset Control. In the private sector, in addition to his leadership roles at PepsiCo, Thompson was a partner in the Atlanta law firm of King & Spalding. He was the founding co-chair of the firm’s special matters and government investigations practice. 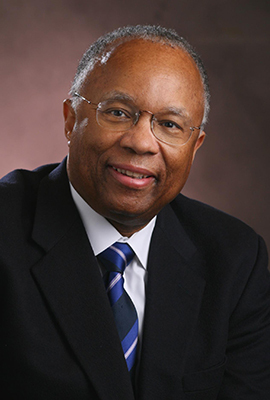 Thompson has received numerous awards for his professional achievements, including the Edmund Jennings Randolph Award for outstanding contributions to the accomplishment of the Department of Justice’s mission, the Outstanding Litigator Award from the Federal Bar Association and a Honorary Doctor of Laws degree from Pace University in New York. He has also been recognized by Atlanta’s Gate City Bar Association as a member of its hall of fame. In 2004, Thompson served as a Senior Fellow with the Brookings Institution in Washington, D.C.
● “The Responsible Corporation: Its Historical Roots and Continuing Promise" in 29 Notre Dame Journal of Law, Ethics & Public Policy 199 (2015). ● “In-sourcing Corporate Responsibility for Enforcement of the Foreign Corrupt Practices Act" in 51 American Criminal Law Review 199 (2014). ● “Keynote Speech: The Reality of Overcriminalization” in 7 George Mason University Journal of Law, Economics and Policy 577 (2011). Thompson holds a B.A. from Culver-Stockton College in Canton, Missouri, a M.A. from Michigan State University and a law degree from the University of Michigan. The Responsible Corporation: Its Historical Roots and Continuing Promise, 29 Notre Dame J.L. Ethics & Pub. Pol'y 199 (2015). In-sourcing Corporate Responsibility for Enforcement of the Foreign Corrupt Practices Act, 51 Am. Crim. L. Rev. 199 (2014). The Reality of Overcriminalization, 7 J.L. Econ. & Pol’y 577 (2011) (symposium). The Blameless Corporation, 47 Am. Crim. L. Rev. 1251 (2010). The Blameless Corporation, 46 Am. Crim. L. Rev. 1323 (2009). Judge Bell and Professional Courage, 18 J. S. Legal Hist. 175 (2010). The State of Judiciary: A Corporate Perspective, 95 Geo. Law Review 1107 (2007). Adrift on a Sea of Uncertainty: Preserving Uniformity in Patent Law Post-Vornado Through Deference to the Federal Circuit, 92 Geo. L.J. 523 (2004). Money Laundering: Business Beware, 44 Ala. L. Rev. 703 (1993) (with E. Johnson).